We had reached the end of the official route. From here, most of the group would return to the Carlisle hotel where we'd spent our first night, while Howard and I headed for my auntie's near Stirling. Howard and I set off after the main group, intending to catch up later as we followed the same route: slantwise down the Great Glen, alongside Loch Ness and Loch Lochy (Lochy McLochface?) to Fort William. 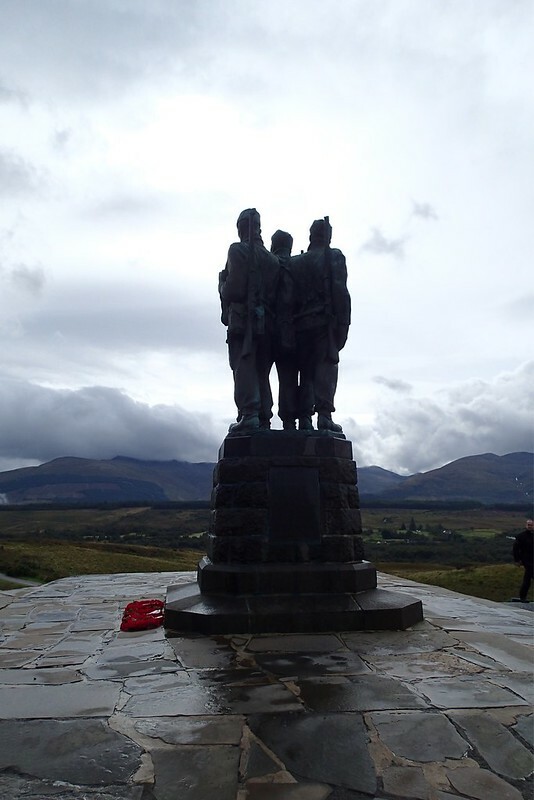 We stopped at the Spean Bridge Commando Monument, whose three bronze figures look out at the landscape where wartime wearers of the green beret were trained. The long 40 and 50 limits out of Fort William were presumably designed to enable looking at the views without holding up other traffic. After Glen Coe the road began to climb, and I soon lost sight of Howard as we worked on overtaking the lorries and caravans (this scenic route also being a vital one for transport). It was windy up in the hills, mile upon mile passing with no sign of human habitation, and I was beginning to panic slightly when the descent began and scattered villages appeared. At last, I entered Tyndrum and spotted the agreed lunch stop, the Green Welly. We had seen no sign all day of the rest of the group. Howard was convinced they were miles ahead, while I was sure we must have missed them somewhere on the road. We had our answer as I was finishing my sausage sandwich, when they walked through the door. It was raining heavily when we left, just for a change, and we stuck together for the next leg as the rain shifted gears from 'persistent, heavy' to 'tipping it down'. We made a diversion to do the Duke's Pass, which must be pretty when the roads aren't awash and you can see the views, before heading to a remote tea shop which proved to be closed. So Howard and I said our farewells in the car park, walking from bike to bike to offer wet handshakes and hugs. An hour's riding in the rain, and Stirling in the rush hour, brought us to my aunt and uncle, who were positively delighted to welcome two dripping, smelly bikers into their home. We spared a thought for the others, and the extra eighty miles to Carlisle, as we changed for dinner. Light rain is fine, but when it's really bad, I still get wet - elbows and crotch are usually the problem areas, the latter because water pools so I'm pretty much sitting in a puddle. Ouch! Yeah, I'd only get that if I was commuting daily in heavy rain myself. I have a rule not to spend more on bike stuff than I spent buying my first bike, which was £500! I expect I'll break it one day, though. You could always blame it on inflation! As Yogi Berra famously said — "a nickel ain't worth a dime anymore". Utlah and I made sure to stop by the Commando Monument on our tour of the Highlands the other year. It was a much drier day by the looks of things, but the view from there is fantastic, whatever the weather. It's actually one of those places that I think looks much better with a brooding sky, as in your (very atmospheric!) photo. I've been there in blazing sunshine and it feels slightly wrong. The long 40 and 50 limits out of Fort William were presumably designed to enable looking at the views without holding up other traffic. Partly, but mostly because the A82 has an appalling record of accidents. If you got through it without having to brake hard for some idiot who thought he could overtake in a van like you can on a bike, you were lucky! The locals have been agitating for the road to be upgraded for at least a decade, but not a great deal has actually been done. Golly - it didn't look that dangerous, but I was a bit surprised when a car blithely followed me into my overtake of a coach, so I can see that.